I saw these on Pinterest, and lets just say, I have fallen in love. They are so simple (and fun) to make, and you probably have all of these materials laying around your home! 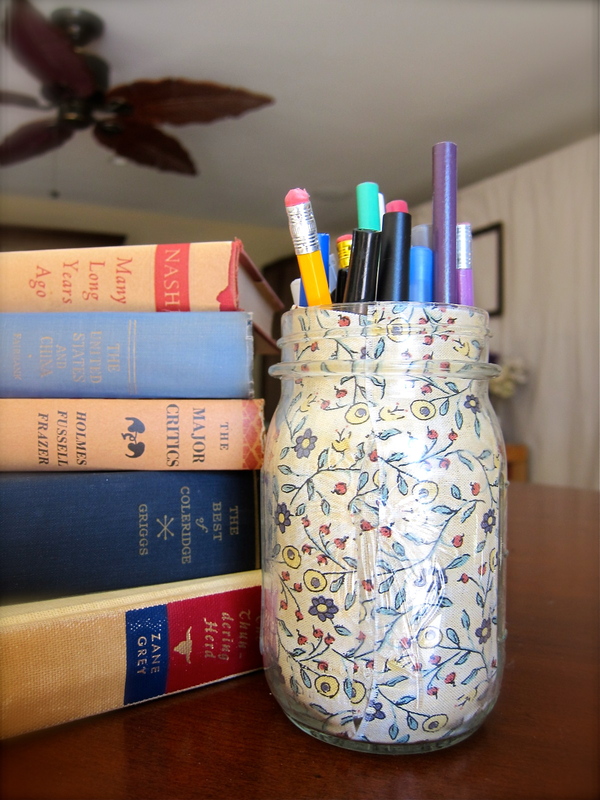 They were originally intended to be votives, but I love them as pencil holders. How cute would these be on your desk? They are sure to liven up any work space. 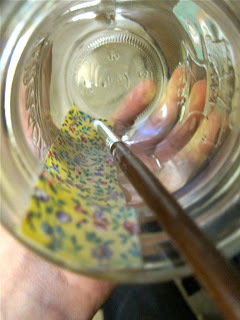 In your small cup, pour in some glue (I used Elmer's) and dilute it with a bit of water, mix well. It should be the consistency of slightly thicker water. Lay your fabric strips down and, using a paint brush, paint the strips with the glue, one at a time. Place the strip into your jar (pattern side facing the jar) and position it. 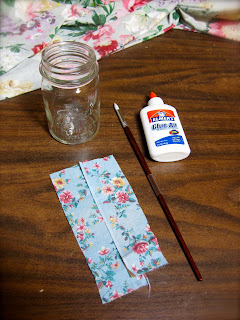 Use your paintbrush to push any air bubbles out from between the fabric and the jar. Repeat with the rest of your fabric. Allow to dry overnight before using. These will work great as votives (it would be best to use battery operated tea lights instead of real candles), pencil/paint brush holders, vases for faux flowers, or just cute decor! I love this idea. 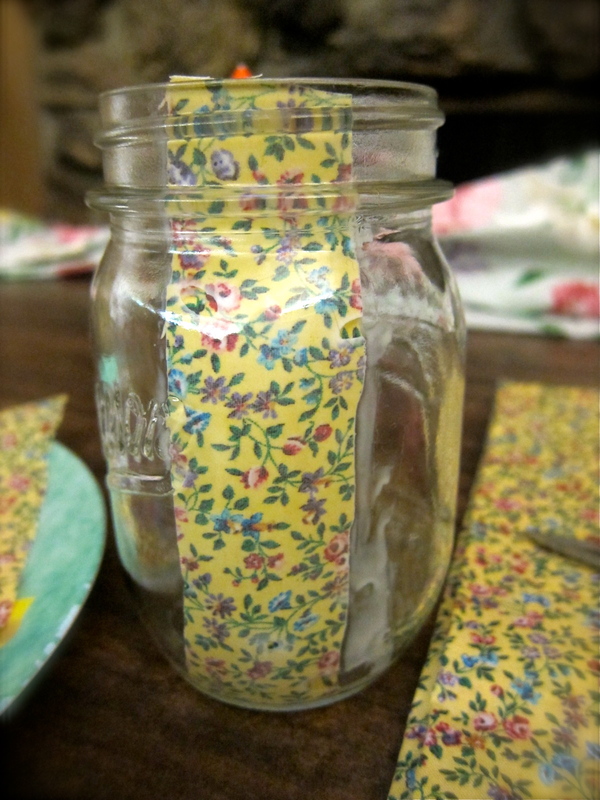 I do have a few extra jar AND fabric collecting dust. Thanks for sharing! I'll have to make these soon! These are adorable! I'm pinning these. Super simple and super nice. My favorite combination! I'm imaging the possibilities already. @Liz: I'd love to! Thanks for the invite! 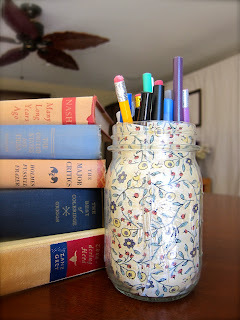 I have pen jars on my desk I am going to do this to right away! So cute!